The APSU School of Nursing offers two tracks to attain a Bachelor of Science in Nursing, a Masters with two concentrations, and a post-masters certificate program. Students develop skills through engagement in evidence-based learning and interprofessional education and practice. The nationally ranked School advances the entire profession, from practice to education to policy. Welcome to the Austin Peay State University (APSU) School of Nursing website. The APSU School of Nursing offers two nursing education programs: the Bachelor of Science in Nursing (BSN), this includes the RN-BSN Completion track (for licensed AS degree RN’s), and, a Master of Science in Nursing. The Master of Science in Nursing degree allows the student to select between two concentrations: Family Nurse Practitioner, or Nursing Education. Post Master’s certificates are also available for students who have completed a master’s degree in nursing and are seeking additional specialization in one of the above concentrations. Both the RN-BSN Completion track and the MSN are offered online. This is the right time to consider a career in nursing or to pursue an advanced practice degree. Due to a complex relationship among social, political, and economic factors there will continue to be a shortage of professional nurses well into the year 2030. The Bureau of Labor Statistics released employment projections for the time period 2012-2022 indicating that the RN workforce is expected to grow from 2.71 million in 2012 to 3.24 million in 2022, an increase of 19%. As the nursing workforce ages and our profession is faced with mass retirements, an additional 500,000 nurses will be needed just to replace those retiring, totaling a need of approximately 1 million nurses. The APSU School of Nursing is proud of its reputation and student learning outcomes. The BSN graduates perform well above the national standard for passing rate on the National Council Licensure Examination (NCLEX-RN) and local employers welcome and compete for our graduates due to this reputation. We network with the US Army to provide unique learning cohorts for military personnel and are able to boast of graduates who are employed all over the world! Changing healthcare policy and practice is demanding that health providers change the way they practice. Nursing is a flexible and nimble profession with a history of responding to such change! The APSU faculty and staff are highly educated practitioners and seasoned faculty members. They are well qualified to prepare graduates for these new roles in community health, healthcare policy, research, health data management, and advanced practice. I welcome you to contact us. We are pleased that you visited our webpages and look forward to hearing more from you. The Austin Peay State University School of Nursing is designed to prepare the nurse generalist and nurses in advanced roles to meet regional healthcare needs while cultivating an appreciation of diversity and an understanding of the national and global healthcare environments. The Director, staff, and faculty of the School of Nursing demonstrate respect for all persons, serving as role models and mentors to students as they evolve in professional development specific to their level of education and practice roles. A supportive, positive, and collaborative environment is a hallmark of the school. The School of Nursing is committed to empowering students to become critical thinkers, healthcare leaders, excellent communicators, and life-long learners. The school serves traditional and non-traditional students, including the military community. The APSU School of Nursing’s vision is to develop leaders in nursing and healthcare who have the critical inquiry, skills, and values for life and practice in a global society. The BSN program is fully accredited by the Commission on Collegiate Nursing Education (CCNE) until December 31, 2023. CCNE website. The School of Nursing is seeking CCNE accreditation for the APSU independent MSN and Post-Graduate Certificate programs with a site visit scheduled for Fall 2019. APSU School of Nursing is fully accredited by the Tennessee Board of Nursing. 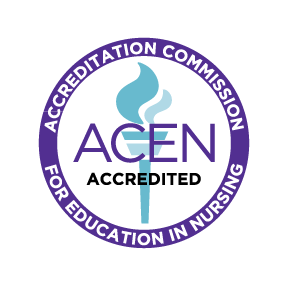 Accreditation Commission for Education in Nursing (ACEN) website.